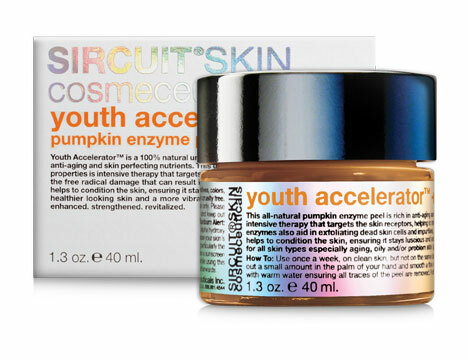 Youth Accelerator™+ is an all-natural pumpkin enzyme peel that’s rich in anti-aging and skin perfecting nutrients. This unique formula with powerful antioxidant properties is intensive therapy that helps to minimize the free radical damage that can result in accelerated aging. The natural pumpkin enzymes also aid in exfoliating dead skin cells and impurities, while at the same time delivering vitamins and nutrients to the skin. Protein-rich Albumen helps to condition the skin ensuring it stays luscious and soft. The results? Younger, healthier looking skin and a more vibrant complexion! Smells great, but no ... you can’t eat it! Enzymes gently exfoliate dead skin cells. Imparts essential antioxidants minimizes the effects of free radical damage. Reduces the appearance of fine lines and improves skin texture. How To: Use once a week, on clean skin, but not on the same day that you use another scrub or peel. Using a spatula (to avoid contamination), scoop out a small amount in the palm of your hand and smooth a thin layer gently over your face, avoiding the eye area. Leave on for 10 to 15 minutes. Gently rinse with warm water ensuring all traces of the peel are removed. Follow with Sircuit Addict™+, O.M.G.™+, or Sircuit Weapon™+ serums. For added benefits, Molecular Mist™+ and Cloud 9™+ may be applied as part of your daily home treatment program. Shake well before use. Concentrated Pumpkin Extract: A fruit enzyme rich in Beta-Carotene that helps to improve the overall appearance of the skin. Lactobacillus/Pumpkin Ferment: Exfoliates and helps enhance natural cell turnover as well as deep cleans pores resulting in the improvement of the visible signs of aging and supporting long term anti-aging protection, including improved skin tone. Albumen: A protein derived from egg whites that is both nourishing and lifting which helps to fight against skin concerns including wrinkles and fine facial lines to benefit the skin’s overall quality and appearance. Formulated With: Cucurbita Pepo (Pumpkin), Glycerin, Aqua (Water), Lactobacillus/Pumpkin Ferment Extract, Lactic Acid (L), Polyglyceryl-4 Caprate, Fructooligosaccharides (D-beta), Albumen, Gluconic Acid (D), Vanilla Planifolia Fruit Oil, Hydroxypropyl Methylcellulose, Eugenia Caryophyllus (Clove) Leaf Oil, Cinnamomum Cassia (Cinnamon) Leaf Oil, Zingiber Officinale (Ginger) Root Oil, Myristica Fragrans (Nutmeg) Kernel Oil, Citrus Aurantium Dulcis (Orange) Peel Oil*. *USDA Certified Organic | NOP. Phthalate-free.